The X8 is a giant flying wing that has gained some popularity among the hobby UAV enthusiasts since was introduced few years ago. The wing is made by Chinese Skywalker, out of rather durable EPO foam. I have had the idea for getting one for few years and finally I got one for myself. I have been planning to use the wing for developing a digital video link and a redundant small UAV autopilot system. When comparing all the available consumer-grade small UAV systems, at the moment of writing, very little research and development at all has been made in terms of redundancy and reliability. Which in turn, is which I wanted to study. My goal was to make a redundant, fail-safe and extremely reliable control system for a small UAV and the X8 seemed to be a good airframe for this experiment. The project begun with making of the airframe, and continues on at the time on writing this. As always, I did not wanted to settle with the stock, the X8 I ended up with is a drone made of sleek fiberglass and a tendency to go fast, instead of being a slow skyfloater like the original X8 is. This article is mainly about constructing the airframe. The redundant avionics will be discussed in later posts. The X8 comes in a “kit” -form and it has gone through few design iterations. The airframe I have, has some features that were added later on. Such as rounded winglets, nose without a hole for a camera and new plastic wing joiners for quick wing removal for transportation. Nice. As I do not like foam as a material, I wanted to cover the airframe somehow to make it durable. Many people use vinyl sticker for the purpose but I decided to take a (very) hard way and use fiberglass. I knew that I was going to hate working with it but I still chose to proceed with glassing the X8. I started building the X8 by modifying the wing parts to my taste. The first thing was to remove a terrible camera pod from the belly of the fuselage. It has been said, that during the landings it will flip the wing over, also destroying the camera in the process. As the ugly looking pod also decreases the efficiency of the airframe, it had to go. I made the winglets non-removable. It was the only way to make them clean since the parts fitted so poorly each another. Some heavy shaping and sanding of the foam was required for a smooth finish. The airframe was assembled together using polyurethane glue which has to be one of the nastiest substances on this planet. It is the only glue that can be used to hold the EPO foam pieces together, making a big mess in the process. It dissolves to almost nothing, ruins clothes and sticks to the fingers with simply no easy way to remove if gloves are not used. And like polyurethane foam, it expands. This can be used to fill the huge gaps between the poor quality foam parts or wreck some havoc in form of unimaginable mess. Prior to gluing, I grounded the parts for good glue and laminating epoxy adhesion with 50-80 grit sandpaper and a steel wire brush. Without this nothing adheres to the foam and the job will be ruined. After the assembly was completed, it was time to sand the complete airframe smooth and then roughen up the surface where it was needed. The first step was to cut the required pieces of cloth to cover the part. I used rather heavy 80 grams cloth for the purpose. The cloth pieces had to be slightly larger than the part to be laminated since I wanted the cloth to overlap over the sides of the parts, especially over the leading edge. Then the laminating epoxy was mixed with the hardener and white color pigment. I wanted to make the wing white because I did not want to worry about the wing heating up the sun which could damage or distort the foam core. The color of the parts comes only from the epoxy, paint was used only on the ailerons. This way there is no paint to get chipped off in case of rough handling. The amount of the epoxy and the hardener must be measured very carefully since if the ratio is wrong, it never cures. I used disposable syringes for the purpose. Speaking of the nasty substances, the epoxy and its hardener is among them. They are very irritating and skin exposure will eventually develop allergy to them. They are almost odorless but I wore a full-face respirator while working and I let the parts cure in a well-ventilated place. The curing time was rather long, 24 hours. Sanding and cutting the fibreglass is similar to the carbon fiber – it must be done wet and personal protective equipment is also essential. The wings were the parts that I glassed first, one side at a time. I wanted the clothes to overlap on the leading and trailing edge to make them strong. I applied the epoxy with a roller and a sponge. The correct amount of epoxy is applied when the cloth gets wet and changes to almost transparent. If the cloth remains white, add more epoxy and if it gets a very shiny, liquid surface, too much epoxy was used. After the wings were glassed, the fuselage, the hatch and the ailerons were done. After glassing the wings, excess cloth was trimmed off first with scissors and then with the sanding block. This produced plenty of needle-sharp hardened fibers which was among those things why I avoid working with composites. The surface is rather rough and ugly after glassing. As I wanted the surface be as durable as possible, instead of filler I used a cocktail of epoxy, micro-balloons and white pigment to make it smooth. After few of these coats and a lot of wet sanding, the parts looked how I wanted. To achieve a smooth, glossy finish, the parts were sanded with sandpapers up to 2000 grit, then polished using polishing compound and finally using high-gloss resin car wax. The hatch was meant to be held in place using lost in-flight despite the magnets and plywood tabs recommended by the manufacturer. According to various hobbyist forums, the hatch will fly away when manufacturers instructions were followed. 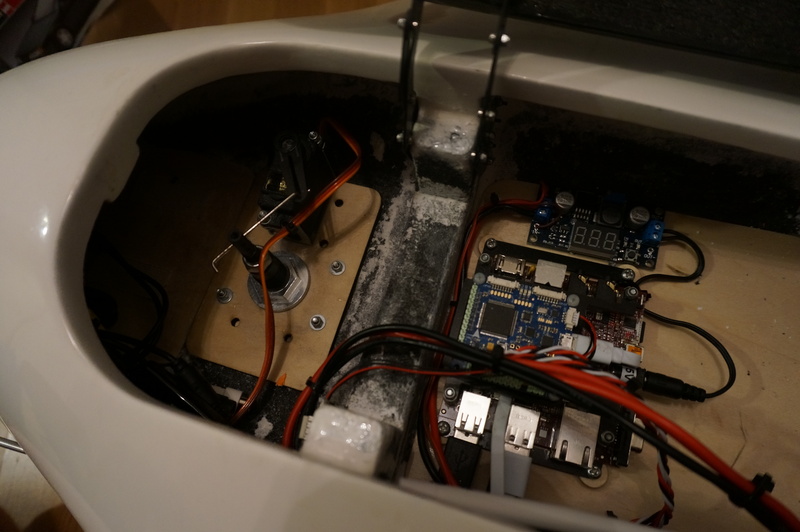 The magnets will also disturb the electronic compass of the autopilot, so this was out of question. I wanted to make hinges for the hatch, that first raise it a little off the fuselage and then rotate it towards the fuselage to make room not only for installation, but for the emergency parachute. The dual scissor mechanism I designed is like the one that can be found on a trunk of a car. I first made a cardboard mock-up of the mechanism and then modeled it in my CAD. The hinge parts were then machined out of 1 mm fiberglass sheet. When I assembled the wing for the first time, it became clear to me that this thing is huge. And launching this heavy, pusher propeller wing by throwing will be difficult and hazardous. I wanted to install the landing gear. I ordered one gear set from the eBay and I was not do positively surprised. The kit come with a steerable nose wheel, complete with a defective servo with no splines on the axle. Attaching anything to it was impossible. The quality of the plywood parts was also questionable that were supplied with the kit to mount the undercarriage with. After nagging to the seller at eBay who replaced the servo and making my own mounting parts using my CNC mill, I ended up with pretty good end result. The metal parts, made of some unknown cheap and heavy alloy, seemed to be almost fine. Now it was time for the electronics. After having used some brand of chinese speed controllers with success in my drones, I bought a beefied-up one version for the wing from the same brand. As I generally do not trust the quality of these components, I open them up and inspect every time before installing them. Which was good I did. This speed controller had assembly, wirings and solderings done so bad, that a complete short-circuit, crash and fire was imminent. With this wing I wanted to experiment with lithium-iron-phosphate batteries because of their improved safety over the more commonly used lithium-polymer ones. I built then battery packs myself using only high quality A123 cells. The battery packs ended up rather heavy and they were later replaced with regular lithium polymer batteries.